There is an exception to Saturday’s post, which said that a stock market crash would have only minor economic effects on America. Just as an oil crash hurts oil producing regions, such as Texas, a stock market crash hurts areas that produce stock certificates. Printing this “paper” is the most profitable part of the San Francisco Bay economy, putting it in the cross-hairs for the inevitable crash. Sector crashes often harshly affect industries and regions even when the national impact is minor or even beneficial. An oil bust hurts not just oil exploration and production companies, but also regions focused on that industry (e.g., Texas). Similarly a stock market crash will hurt companies that trade stocks (brokerage firms) and those that print stock certificates (Tesla Motors) — and areas that manufacture stock certificates, like the San Francisco Bay Area. The fall can be quite far. Here’s the price graph of the iShares Nasdaq Biotechnology Index (Symbol IBB), as it rose from $80 to $340 in five years. Try not to see the bubble when you look at it (that requires an investment professional’s eye). Do not ask how many of its 145 constituent stocks are profitable. The ETF’s profile is here. What will happen after the crash? The venture capital industry will evaporate, except for its long-experience super-competent core. The bursting bubble will thin the herds of biotechs, social media companies, and other bubble industries. Bankruptcies for the unprofitable while the survivors reorganize to produce cash flow and profits instead of glitzy investor presentations and clickbait headlines. That means layoffs, and wage freezes for the rest — which slowly ratchet real wages back to normal. It will force evolution of the cultures at some corporations. The New York Time’s expose about Amazon reveals how the management squeezes its white-collar workers (it doesn’t mention the sweatshop working conditions in its warehouses). Only its insanely hot stock price makes that possible, as workers toil for the chance to profit from investors’ greed — more so than their wages. Amazon’s price to earnings ratio crashing to 30 (after it’s forced to generate consistent profits) will end that game — and reintroduce the 40 hour workweek. 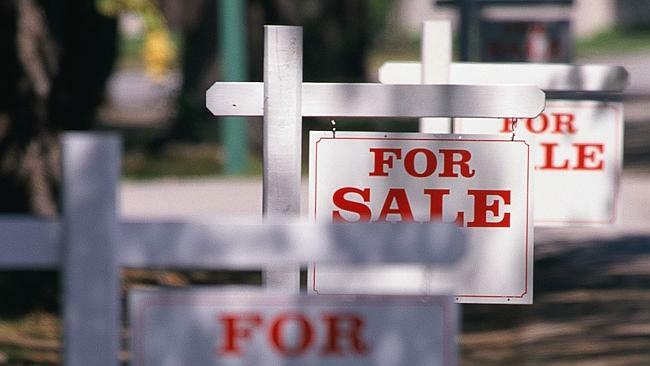 When a regional economy breaks, its real estate prices usually crash as well. San Francisco has been one of two great beneficiaries of the debt supercycle since 1982. The result of its field of dreams burning will not be pretty. 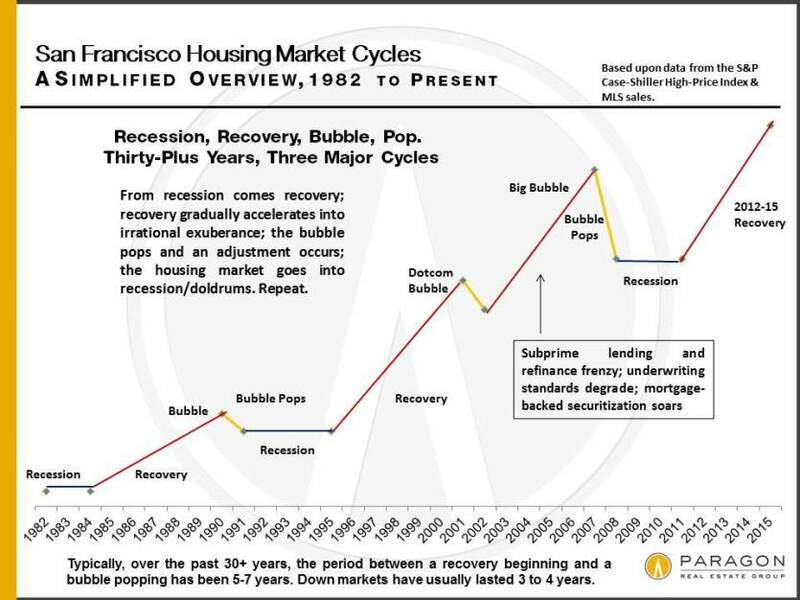 For its history see “Recessions, Recoveries & Bubbles: 30 Years of Housing Market Cycles in San Francisco” by Paragon Real Estate Group. This is a cycle, not the apocalypse. Boom-bust cycles are an inherent aspect of free market systems. Sometimes government policy restrains them. Sometimes — like now — it magnifies them. By 2115 it will be a footnote in the history books. At some point SF will experience that one in a hundred years earthquake and it will never again be the same as it was. It is the tenth anniversary of the New Orleans flood and it has come back but not as it was. If I was still in the tech business I wouldn’t take a job in SF. Most technical people work long days and looking at a screen all day is pretty much the same anywhere. The expensive housing and long commutes would be the deal breaker for me. I did that in New York City and it wasn’t worth the long days, four hour commutes, and 50% tax rate. SF is now pretty much the same. 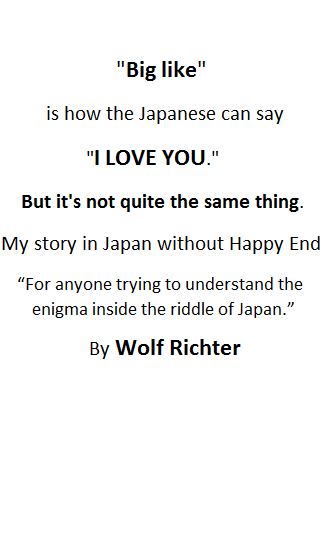 Ah don’t say that! Some of us live in SF bay area and not all of us can afford 1.5+ mil houses! Petunia, I spent much of my life in Texas and Oklahoma. Back then there were no earthquakes there, though fracking has now changed that. But we did have tornados. I saw several up close, including the one in 1979 in Wichita Falls, where went to college. Its northern edge passed three blocks by my place. A single black wall with parts of houses twirling around in it. If I remember right, 64 people died. A third of the town was leveled. But people are tough. They get through natural disasters wherever they hit. So yes, SF will not escape a big one. But it’s part of life here, we live with that idea, just like people in Tornado Alley live with the idea of destruction by tornados, and just like you folks in Florida and along the East Coast live with the idea of hurricanes. Americans are a hardy people. Once the dust settles, we pick up the pieces and put it all back together (not always successfully though, but we try). I can’t speak for others, but we love living here in the crazy city of SF. Sure, traffic is insane (that’s why I walk everywhere, which is another thing I love to do), and the bubbles are insane, and some of the politics are insane, but if you keep your sense of humor about it, it’s OK. And if an earthquake comes, so be it. Americans are a hardy people” but like ALL human beings they are also no match against the deleterious effects of ionizing radiation. What is a normal cpm in America? From 5 to 20 cpm. Which is worse? Gamma or beta radiation? Gamma radiation can travel much further distances and penetrate the body easily, so whole-body irradiation generally causes acute radiation sickness before skin effects are evident. Beta and alpha radiation have a low penetrating power and are unlikely to affect vital internal organs from outside the body. Any type of ionizing radiation can cause burns, but alpha and beta radiation can only do so if radioactive contamination or nuclear fallout is deposited on the individual’s skin or clothing. (So never bring street shoes into the house). Notable artificial sources of gamma rays include fission such as those occurs in nuclear reactors and the sources of beta rays are nuclear accidents as in Chernobyl and Fukushima, the latter’s cesium137 is causing havoc in the West coast of North America right now. Former Navy sites that are heavily contaminated (Cold War stuff). A few years ago, I wrote about Treasure Island, which is a couple of miles across the water from our place. I look at it every day, and I swim in the Bay, ingesting this material. Here is my old article on that ongoing scandal. “It summed up decades of US Government efforts to bury nuclear sins under layers of ignorance,” I wrote. There are a number of other sites in SF that have been contaminated by the US military during the Cold War. They’re trying – or not trying – to clean them up eventually. Meanwhile, people live right there. The oil crash has resulted in lay-offs in the central California area. A friend of mine was hired last year by a company that works in the California oil fields. In March he was laid off due to budget cuts by the oil companies. He was in the IT field, working on the oil field communications networks. Yesterday, the minute oil hit $38 a California refinery was shut down for immediate repairs. They are not even trying to hide the fact that they will stoop to anything to increase the price. I’m still waiting for my electric bill to go down since it was increased when oil hit $140. Economy wide boom-bust cycles are not inherent to the free market. You might get localized booms and busts, but this universal, economy wide boom and bust is a feature of an artificial, controlled “market”, that prevents creative destruction and allows malinvestment to accumulate throughout the economy. When the market for money, the foundation of trade, is not free; how can the economy built upon that be called “a free market”? what has been will be again, what has been done will be done again: there is nothing new under the sun. I too live in the Bay Area and having been through three real estate recessions, don’t plan on moving but I have paid off my mortgage . Having been through many earthquakes, I retrofitted my home to make it safer in an earthquake ( cheapest and best insurance). As LBJ said about the presidency – sometimes you have to be like a jackass in a hailstorm, you just have to hunker down and take it…..
or maybe you can find shelter before the inevitable storm hits if you plan ahead.